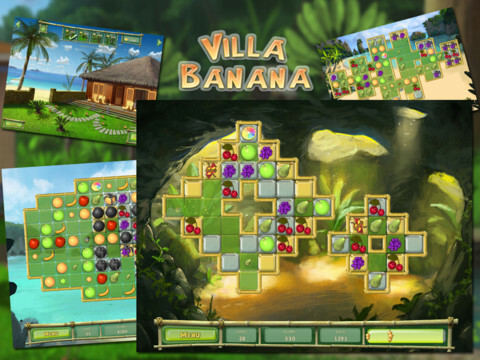 Villa Banana HD is an iPad game developed by Notus Games Ltd. Featuring a fun puzzle with a gorgeous island setting, this game features match 3 game mechanics with a twist. The first thing you’ll notice about Villa Banana HD is the chill island atmosphere the game offers. The background is a soothing white sand beach, and the background music that plays includes plenty of mellow island sounds and ukulele jams. This is a nice change of pace from most puzzle games, which feature music that’s meant to pump you up: Villa Banana is more concerned with chilling you out. Already had a high anxiety day? This puzzler can help you chill out. Unlike some of the tougher match 3 games out there, you can move your fruit pieces all over the board to match three similar fruit pieces. However, there’s a twist: you’re trying to clear the board, and each move you make causes more fruits to appear on the board. Once you clear the fruit from the “plates” on the board, the level comes to an end and you can move on. 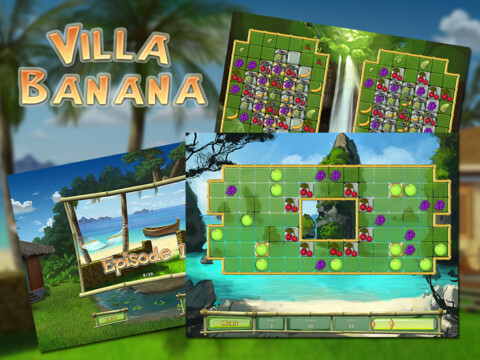 In addition to the free version of the game, Notus Games also offers a Premium version of Villa Banana HD. This premium version unlocks all of the limitations that the free version has. Alternatively, you can simply upgrade the free version of Villa Banana HD from within the free version of the app. Use your match 3 skills and awesome power-ups to set the highest score in the Challenge mode, and then buy new upgrades like pink flamingos or exotic peacocks to display in your island paradise. 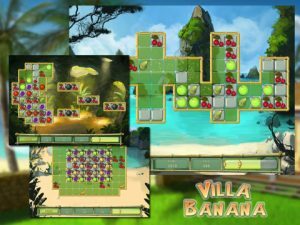 If your idea of the perfect puzzle game is a fun game that can be played at a relaxed pace, playing a few rounds of Villa Banana HD should be fun for you! It’s not quite as good as sitting on the beach of an actual island paradise, but it is still a pretty sweet way to unwind at the end of a stressful day at work. Villa Banana HDis compatible with iPad. Requires iOS 5.0 or later.